This story wasupdated at 8:22 p.m. EST. 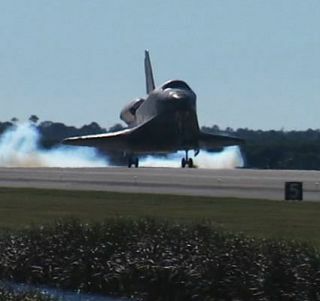 Space shuttleAtlantis landed safely in Florida early Friday, gliding in under sunny skies towrap up a successful 11-day delivery mission to the International SpaceStation. CommanderCharlie ?Scorch? Hobaugh brought Atlantis and his six crewmates to a touchdownat 9:44 a.m. EST (1444 GMT) on NASA?s Shuttle Landing Facility runaway at theKennedy Space Center in Cape Canaveral, Fla.
"Couldn'thave picked a clearer day," Hobaugh radioed Mission Control as he saw therunway below. "That was apicture-perfect end," Mission Control replied just after landing. "Everybody welcome back to Earth." Their arrivalconcluded Atlantis? STS-129 mission, which delivered about 27,250 pounds(12,360 kg) of vitalspare parts to the station in order to extend its lifespan. The 4.5million-mile spaceflight included three spacewalks, the birth of a crewmember?s daughter back on Earth, a Thanksgivingcelebration in space, and also returned the last station resident to arriveand depart the station by a U.S. space shuttle. NASA treated thereturning astronauts with a turkey dinner with all the fixings to make up forkeeping the crew in space over Thanksgiving. But first, they had to go throughmedical checks, though it was worth it, Hobaugh said. "You go seethe doc, you get a turkey dinner,? he joked. ?It's a pain.? The new father -astronaut Randy Bresnik - rushed home to Houston after finishing his ownmedical checks to be with his wife Rebecca, son Wyatt and newbaby daughter Abigail Mae. She was born last week in between two of themission?s spacewalks while Bresnik was stuck in space. ?We werefortunate enough to get [a spacewalk] out, find out that my baby was deliveredsafely and she's healthy... and then we got to go out the door for another[spacewalk]. It was the most amazing three days of my life so far,? Bresniksaid before landing. Abigail is Bresnik?s second child. He and his wife alsohave a 3-year-old son. Returning toFlorida with Hobaugh were shuttle pilot Barry ?Butch? Wilmore and missionspecialists Michael Foreman, Leland Melvin. Randy Bresnik and Robert Satcher,Jr. The shuttle also returned NASA astronaut Nicole Stott, who spent 91 days inspace during her own mission tothe station. ?I was reallysad to leave the station and my crewmates there, but I have a new bunch here who are really,really great and I am getting to go home and see my family,? Stott said beforelanding. Stott?s crewmates said she was in good health after her three monthsin space. She was looking forward to some pizza and a cold Coca-Cola once afterlanding. In addition to beingthe first mother to serve on a long duration station flight, Stott is also thelast station astronaut expected to be switched out using a NASA shuttle. Shelaunched in August on the shuttle Discovery and returned on Atlantis. Allupcoming station crews will launch and land on Russian Soyuz spacecraft for atleast the near future. Stott?sdeparture left five crew members staffing the station, but that compliment willdrop to just two on Monday evening. Frank De Winne, the station?s first EuropeanSpace Agency (ESA) commander, as well as Canadian Robert Thirsk and Russiancosmonaut Roman Romanenko will depart on Soyuz TMA-15 for their own return toEarth, leaving only U.S. commander Jeffrey Williams and Russian flight engineerMaxim Suraev as the Expedition 22 crew. Three more crewmembers are scheduled to join Williams and Suraev aboard the station on Dec.22. NASA is also monitoring a piece of space junk - the remains of a Delta 2rocket - that is expected to fly within 6 miles of the station late Saturday.Mission Control is expected to decide late Friday whether the station will have tomaneuver to dodge the space junk. The STS-129mission was the 31st space shuttle to visit the orbiting outpost andcoincidentally, the 31st flight for Atlantis as well. It launchedNov. 16 on a mission to delivering two large pallets of spare components tostock the station before the shuttle?s planned retirement in 2010. Among the spareparts hauled to the station were huge gyroscopes, tanks and pumps, an ammoniatank assembly, as well as extra components for the station?s robotic arm andother systems. The astronauts installed the spare parts during their threespacewalks among other maintenance chores. The Atlantis astronautswere the eighth space shuttle crew in history to mark the U.S. Thanksgivingholiday in space. Foreman said he had saved some of his turkey meals fromearlier in the spaceflight to cobble together a makeshift dinner. The fifthshuttle flight this year, the STS-129 mission marked the penultimate flight forAtlantis, which is scheduled to launch on its final mission, STS-132, in May2010. It also markedthe most shuttle flights for NASA in a single year since 2002, when the agencyalso launched five missions. NASA's record for most shuttle launches in a yearis nine. ?This is anamazing year for us,? said NASA?s space operations chief Bill Gerstenmaier. Thegoal for 2010, he said, is to keep vigilant to ensure that each of theremaining shuttle missions is safe to fly. NASA currentlyplans to fly five moreshuttle missions to complete the assembly of the station and stock theorbiting laboratory with more supplies. The shuttle fleet is slated to retirein the next year or so to make way for new spacecraft capable of leaving lowEarth orbit. ?It?s like goinginto that championship game,? Gerstenmaier said. ?You can be your own worstenemy?We?ve just got to stay at our top-level performance. ?